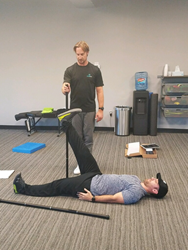 ProBar Mobility, the premier bar-based mobility system on the market, has partnered with Damon Goddard of AMPD Golf Performance to help golfers of all levels improve their overall game through better movement patterns and flexibility. Developed out of the necessity to help prevent injuries due to poor movement patterns, ProBar Mobility corrects poor movement patterns and creates a wider, more precise range of motion for enhanced, injury-free performance. Whether it’s for improving golf performance, undoing the tightness of sitting at a desk or simply moving better in everyday life, ProBar was designed to increase mobility, improve joint stability and strength, and ultimately help athletes perform better and reduce the risk of injury. With over 18 years of experience in the sports performance and fitness industry, Goddard and his team have worked with all levels of golfers, ranging from elite junior golf-athletes to three-time Major winner and one of the best in the world, Jordan Spieth. A Level 3 Certified Golf Performance Instructor through Titlelist Performance Institute and guest on the Golf Channel, Goddard is considered one of the leading experts in golf performance. He is an athlete, author and educator who focuses on proprietary individual athlete assessment programs that result in customized plans for every athlete. The ProBar is one bar that configures into three training modalities including a long bar, short bar, and dual bars, offering the user a variety of exercises that can address a wide range of issues such as tight shoulders, a sore back or tightness in the sitting and squat positions. The patented twist-and-pull feature with spring-loaded resistance engages muscles to correct poor movement patterns and dysfunction that often lead to pain and injury. Additional weights are included in the system so that users may adjust resistance with subsequent progression. “The ProBar and its many different configurations is an excellent device for golfers and other skilled athletes who are seeking greater mobility, better alignment, and improved movement," said Bo Dubbert, CEO of ProBar Mobility.